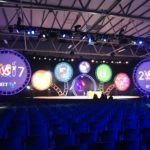 Dublin based audio visual production company CAVS (Corporate Audio Visual Services) have again supplied audio and video services for the 2017 BT Young Scientist Exhibition & technology exhibition. A national event they have supplied past 20 years. This year after investing in MIDAS and Klark Teknik products in 2016 they made the change from analog to digital Midas. 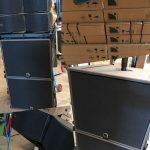 The main auditorium audio was driven by a Midas Pro2 connected to a pair of Klark Teknik DN9680 fibre AES50 multiplexers – over fibre – to a pair of DL251 IO Units. 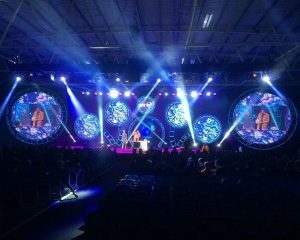 The exhibition opening ceremony consisted of a live performance by Irish band The Academic, and introduction and welcome from the CEO of BT Ireland, Colm O’Neill and an address by The President of Ireland, Michael D Higgins. All this in front of a capacity crowd of 4000 delegates. The event was also recorded on LogicX using the Klark Teknik DN9650 Network bridge complete with KT-USB interface card. A second venue on the site was also run via a MIDAS Pro1. 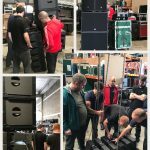 Chip Devitt – Technical director from CAVS say “the Midas equipment we deployed really helped us raise the bar audio-wise this year, from the purity of the preamps to the way we could use the POP groups to run the show really speed up our workflow. Using fibre also gave us a very quiet interference free system – with the ability to run a lot of AES 50 line up to 500M point to point. All the CAVS audio team we very happy with the results”. Alan Murphy of AMPLIFIED – MIDAS & Klark Teknik’s sales partner in Ireland says “I’m delighted to have CAVS onboard with MIDAS and Klark Teknik products and to see them in use on high profile national events such as The BT Young Scientists. Continued success to all”.